Geriatric Interest Network, GIN, continues to grow as a nonprofit, tax exempt, organization whose members represent providers of diverse geriatric services or products. Through our GIN leadership team, members and sponsors, we offer regular forums and opportunities for education, informal support, networking, advocacy, and resources to enhance sensitivity to geriatric issues. To learn more about GIN, including becoming a member, sponsor and/or participating in one of our future events, send us an email using the contact form below. This email is checked regularly and a representative of GIN will respond to your message. If you have an urgent need, please call Blair Senior Services, Inc. at 1-800-245-3282. As a designated 501(c) (3), tax deductible donations to help support the Network are gratefully accepted. 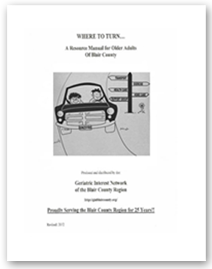 Contributions can be made to the Geriatric Interest Network of the Blair County Region and mailed to BSS, 1320 12th Ave. Altoona, PA 16601.